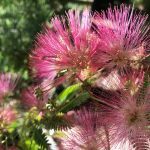 I know as a Landscape Designer in Santa Clarita, California I’m supposed to be showing you How to Landscape your home, but if you have been following my blog at all you know that I can’t resist a good “How Not To” post. Thursday morning I was walking my dogs and strayed off the paseos (which is my usual morning routine) and on to the streets near my home. 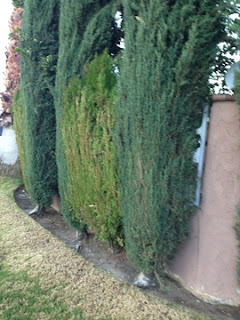 Within half a block I was assaulted by one terrible pruning job after another. Most of the photos I’m going to share with you are from THE SAME BLOCK! 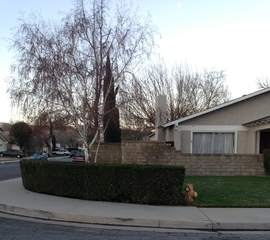 Oy vey, I’m wondering if there is one Landscape Janitor that is doing all these houses. It isn’t a gardener – that’s for sure. A true gardener could NEVER do this to a friend (and all my plants are my friends). Here we go, first here is a Lavender Box – if I told you that blossoms generally grow on the tips of the plant, how many lavender blossoms do you think this baby would have? Not many, and of course all on the top. 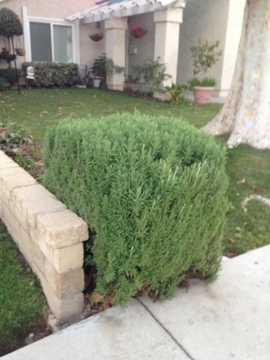 Now, you say – don’t the French trim lavender into hedges for parterres? Yes, you’re be right about that but please, in what universe is one lonely plant a parterre? The Rhaphiolepis Round About. 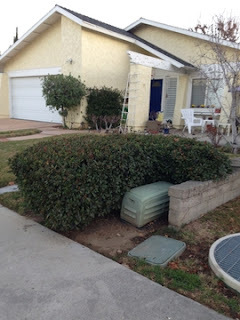 This poor Indian Hawthorn was pruned to geometrically wind around the CATV box, really? Really? I think if I was going to do this I would have added a front piece so the neighbor could share in the joy of a hidden utility box. But of course, I’d never do this. I don’t own a chainsaw or hedge clippers. If I can’t do it with pruners, it doesn’t get done. (Yes, I call an arborist to do my trees). 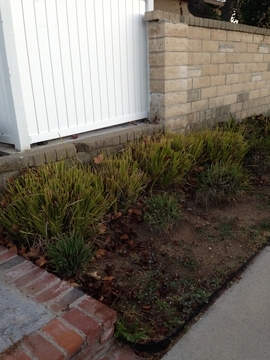 Fortnight Lily Fiasco: If you want a smaller plant, buy a smaller plant. You can’t just make the plant the size you want it to be, unless of course you like this look. I for one do not. I only use Fortnight Lily Plants in places where they can grow to their full size, minimally 3′ x 3′, that doesn’t sound big but it really is. Flat Foliage or How wide is your hedge? This is completely ludicrous, two different plants that could successfully be used as screening or hedge plants – but pruned insanely. These two plants want to be at least 5′ wide, maybe this is it’s buzz cut for the year, but it looks very painful to me. Why does it need to look like this? And the Icing on the Cake is: The top photo – the entree’ for the blog post. I don’t even know if I have words for this one. The best thing I can say is that this Landscape Janitor stuck to the Rule of Threes. What the heck is this supposed to be, and how can the homeowner walk out the door every morning? Now, I have to admit I’m not a huge fan of hedges in general but I did find one planting that serves it’s purpose as a hedge, has been pruned regularly, and although it may not be my style I thought I should show at least one successful attempt at pruning. I think they should have planted just one more plant, but then I guess they’d be blocking access to the hydrant. Funny look. 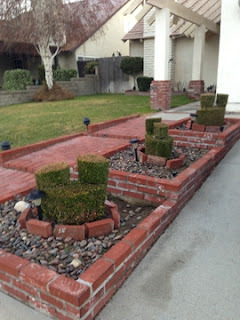 If you enjoyed the How Not To theme, check out these other posts: How Not to Landscape Your Home and another older How Not To Landscape Your Home.